Japan was moving fast from their initial outburst on the scene. The opener, “Automatic Gun” features Stones-like guitar raunch, quickly joined by wailing synth, electric piano, and the dawnings of fretless bass on the part of Mick Karn. He must have heard Weather Report or maybe Joni Mitchell’s “Hejira” between albums one and two. “Automatic Gun” is a queer blend of styles, with the nasal delivery of the youthful David Sylvian, still the glue binding it all, but the music is more attractive than the attempts on album one. I can imagine the components of this album being taken further forward with a little more time for the band to reflect on their development, but Hansa probably demanded two albums a year on their contract. There was no time for deliberation. The band’s quiver of stylistic arrows expanded to include reggae on this album, with “…Rhodesia” being an intriguing stab at the style. Richard Barbieri’s spectral keyboards are a welcome addition to the lengthy middle eight. They add a lot of intriguing texture to what’s a fairly unpleasant song that eventually comes to overstay its welcome at 6:49. The dubbed out coda is nice, though. The angular “Love Is Infectious” sports an interesting meter that gives tantalizing hints of where the group would end up in a few short years, but the track remains a first step only. It’s another slightly repellent track from the band who seem to have no shortage of them at this point in their career. I hold Sylvian’s affected vocals [that cater to a taste I’ve yet to acquire] and his even more slapdash and disagreeable lyrics responsible. The single “Sometimes I Feel So Low” works a little better for me. The syndrums and Ian Hunter-esque piano offset the grungy guitars a little better than the norm for the band. The weird percussive synth hook on the middle eight remains a head-scratching moment that adds an intriguing dissonance to what is the most straightforward track on the album. The title cut was moving in an intriguing Krautrock direction with its circular motorik rhythm that cycled relentlessly throughout the song. If anything, it presaged what Simple Minds would do with “Constantinople Line” on their third album, thought the use of varispeed vocals on the chorus shows the band using a classic Bowie gambit. The last two songs of this album are the real gold for my ears. “Suburban Berlin” has a bifurcated structure that mates reggae skank on the verses with an ornate march structure that vaults into a major key for perhaps the only time on this somewhat dour album. But dour is the band’s métier, and it’s only the contrast that makes the tactic so effective. And effective it is. As were the sustained string patches that built up tension during the song’s lengthy bridge. The album’s final track is nothing more than the sound of the band’s future, telegraphed. “The Tenant” is undoubtedly inspired by the Polanski film of the same name, but the maturation of the band there was profound and dramatic. It truly is the harbinger of their next album in every way. The Satie-esque piano clearly laid the groundwork for “Nightporter,” which was yet another dark film allusion in their future discography. Rob Dean’s deliciously sustained guitars attain a Frippian majesty on the doleful number and Mick Karn’s fretless bass now sounds like it has been given a proper setting for the first time in the album. It’s a track that breezes by at 7:15 and finally sounds like home for the garish street trash who were about to emerge from their glam punk chrysalis fully by the time of their third album in 1980. This entry was posted in Core Collection, Rock GPA and tagged Japan, Mick Karn, Obscure Alternatives, Rob Dean, Rock GPA. Bookmark the permalink. 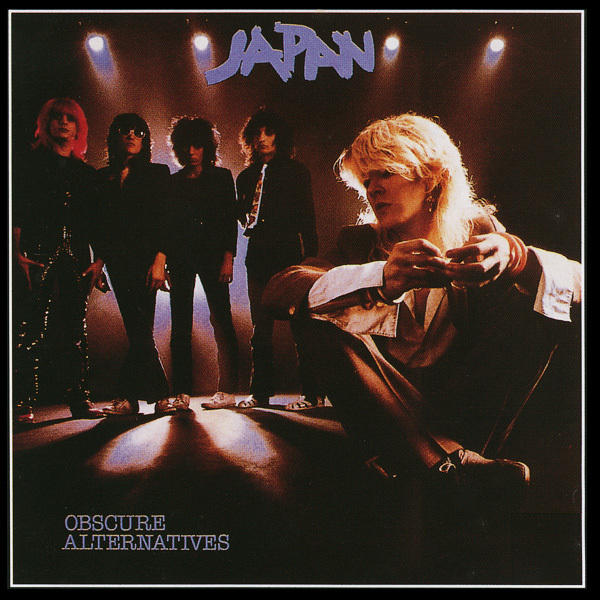 Obscure Alternatives – a really brilliant title which I Japan, at this point, could never have lived up to, musically – was the lesser of the first two albums for me. I agree, further seeds were planted here which would begin to bloom over the following 18 months, but they were still very much in search of a direction and likely coming further under the spell/thumb of Simon Napier-Bell. Suburban Berlin and The Tenant are certainly blueprint tracks for what was to come. The opener reeks of bluesy T-Rex/Sweet glam even if the lyrics seem to be denying that same era in favor for was coming. …Rhodesia confounds me to this day, even if there are some elements of Sylvian vocal style beginning to take shape. I wonder what it might have sounded like without the skank. Deviation is another track where the artistry of Mick Karn is starting to come through. Sax stabs and a plucky bass are the highlights here. They had one more chance to get it right – and take some lessons from these first two albums. I listened to this once a few years ago and have no recollection of what I liked or didn’t like about it. The latter must have prevailed since I never listened again. zoo – It is definitely the product of a band that is still gestating, creatively.